This puzzling, yet colorful, conundrum has finally been solved. By the very definition of their name, oranges are not supposed to turn purple. But recently, an Australian mother stumbled upon the discovery that it is quite possible for the fleshy part of the citrus fruit to change color — under a very rare and specific set of circumstances. That chain of events began earlier this month on Sept. 4 when Annette Moffitt started slicing up a normal-looking orange as a snack for her young son, Charlie. He snacked on half of the fruit's slices, then left the remains and the rinds in the trash, while his mom put the other half of the uneaten fruit in a bowl. 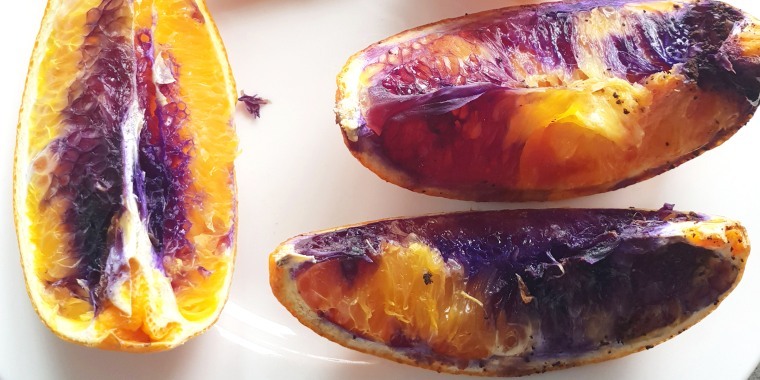 "The orange sat in a bowl overnight with some homegrown lemons, and fast forward to the next morning, while I was making a cup of coffee, I noticed that the orange had turned purple," Moffitt told TODAY Food by phone from her home in Brisbane, Queensland. "I immediately checked on my 2-year-old to make sure he was okay," she added. Thankfully, Charlie was OK and "cheeky as ever," but Moffitt was still concerned about the startling color change. "My next thought [was] 'well, if the orange on the bench is orange, what about the orange he had eaten as well? '," added Moffitt, who fished out the remains from the trash bin. "Low and behold, it was just as — if not more — purple than the orange on the bench." A little internet sleuthing unearthed a similar incident of an orange-to-purple fruit transformation that occurred in Queensland three years earlier, but by the time that family had shipped the orange to government scientists for testing, the pigment had already faded, which meant the mystery had yet to be solved. "I shared some pictures with my friends and connections on [Facebook], everybody came up with their own theories," said Moffitt. "There were no nerves, because my son was fine, it was more of a case of curiosity. I’m the kind of person who likes to know why things work." Moffitt then shipped her puzzling produce to Queensland Health, a governmental health department, for analysis. For the agency's chief chemist, Stewart Carswell, the sample proved a welcome change of pace from the regular blood, urine, soil and fish samples that are usually shipped to his department. “We conducted numerous tests to find out why this orange turned purple overnight,” Carswell said in a public statement reporting his findings. “We put the orange through a variety of chemical and instrumental tests including simple chemical spot tests, liquid chromatography high resolution mass spectrometer (LCHRMS),inductively coupled plasma mass spectrometry (ICPMS) and UV-Visible spectrophotometry looking for metals, natural and artificial colors and pigments, pesticides and other contaminants." The verdict? The knife Moffitt was using proved to be the culprit in this whodunit. It turns out Moffitt's husband had recently sharpened the blade she used, and the naturally occurring anthocyanin pigments in the orange reacted with iron particles on the knife to produce the purplish-blue color on the fruit's flesh. "When they came back with their report, my first reaction was a feeling of relief that nothing sinister had occurred — that no one tampered with the orange," said Moffitt. "It was purely a natural occurrence, albeit a very rare one." When asked if this sort of color-changing reaction posed any risk if someone were to consume the affected fruit, Carswell told TODAY Food via email that his team "cannot claim if someone ate the orange that they wouldn’t be affected as it is not our area of expertise," but did not think that this particular case was cause for alarm. "Anthocyanins are antioxidants and are found in many different fruits and vegetables including red cabbage and blueberries," he continued. "It is not recommended to eat any food that has an unusual colour without knowing why. In this instance, there’s nothing indicating the presence of toxic compounds." Moffitt had initially worried that by sharing her story, people would turn green with unease at the idea of eating oranges. "In actual fact, I spoke to one of my friends and told her that I really hope it hasn't made people afraid to eat oranges," said Moffitt. "But she told me, 'Not all all. We’ve been buying them to see if we could replicate the same thing.'"